Implemented properly and executed well, low-powered tube amplifiers -- especially single-ended designs -- offer a purity and immediacy that can only be approached but never be duplicated by other designs, whether push/pull valves or transistors. Realizing these virtues, however, requires matching such amplifiers with high-sensitivity speakers that present an easy load. Among the first -- and in some instances as yet unequalled -- speakers fitting this requirement were horn-loaded designs from Western Electric, Altec and JBL. These often massive speakers were originally designed for use in clubs, school auditoriums and movie theaters. Unsurprisingly, few of these designs have ever been fully domesticated, though this fact about them has not presented an insurmountable barrier as, in spite of their small living quarters, these speakers and others like them continue to find their way into the listening rooms of many of those knowledgeable Japanese audiophiles who have long favored low-powered tube amplifiers. Some of these designs, including the Altec Voice of the Theater speaker and its progeny including John Tucker's Exemplar horns, K-horns, the occasional Vitavox and representatives from the JBL line from the Valencia to the Paragon to the much desired Hartsfield, have found homes in American listening rooms. Others like Klangfilms and Western Electrics are much harder to find and rarely surface. In spite of their being among the very best sounding loudspeakers ever produced, they have become largely prized collectors' items. The vast majority of these speakers were designed and manufactured in the United States. Most emigrated to Japan and Europe once US designers turned their attention to the advantages of the transistor -- high power at low cost  and few have found their way back home and if so, only at great expense. Like the move from field-coil drivers to Alnico magnets, the move from valves to transistors in the United States had little if anything to do with hopes of sonic improvement. It was, as they say, all about the money. Field-coil drivers are expensive, their power supplies at that time were entirely tube based, therefore much more difficult to service in the field and thus harder to maintain. The discovery of the Alnico magnet was a God send in all these regards but no one at the time thought that Alnico drivers were sonically superior to field coils. How could they be? The field coil produces significantly less distortion and anyone who has heard a field coil design -- the most well known and longest in current production being the Shindo Latour -- will tell you that the difference in resolution between a field coil and any other driver design is staggering. It should come as no surprise therefore to find any number of speaker designers revisiting the field-coil approach. Expect a number of commercial products featuring field coils to surface in the next couple of years but be forewarned: field coil drivers are expensive, even if they are nowadays likely to sport solid-state power supplies. Most speaker design in the United States since the 1970s has been built around ever more exotic driver materials and the inexpensive transistor. Thus, the vast majority of speakers on the market are multi-driver affairs with complex, power-eating crossovers, some of which can eat a rather powerful amplifier for breakfast and another for lunch while still complaining of an empty stomach. This emphasis on technology, engineering, technique and change often masquerading as innovation has rarely wrought genuine progress. Too many modern speakers, at least to my ears, are Hifi-ish and artificial. They simply do not ring true though many an exotic tweeter rings nonetheless. The net effect is that the renaissance in low-powered tube amplifiers here in the US has had the misfortune of running into a deficit of homegrown, sufficiently friendly speakers capable of revealing what these amplifiers are really all about. One requirement of revolutions is weapons. Peaceful revolutions require eloquent spokespersons and a compelling rhetoric. Violent ones require heavy artillery. The low- powered tube revolution in the United States had neither. They had a compelling story to tell, partisans willing to tell it and an audience anxious to hear it. They lacked the transducers necessary to have their story told. The situation elsewhere was in fact very different. Europe remains to this day an innovator in friendly, efficient loudspeaker design. Many, if not all, European designers have favored horn designs, led by the likes of Avantgarde, Acapella, Beauhorn and Hørning, as well as a slew of lesser known companies including Oris, Carfrae and Hedlund. The French company Triangle has relied on more conventional or modern designs but has a long history of designing dynamic loudspeakers that can be mated even with single-ended designs. For quite some time, they have also manufactured their own full-range driver, which may still be available. German designer Keith Aschenbrenner -- whose history includes experience with both Siemens Klangfilm speakers and Jean Hiraga -- currently favors single-driver, open-baffle designs which he distributes under his Auditorium 23 moniker in the Solovox and Rondo models. Facing this deficit, the American response was three-fold: first (and for too long) to try to fit a square peg into a round hole by desperately and often unsuccessfully mating single-ended amplifiers with speakers that had already garnered favorable reputations for their performance with other amplifiers; second, to import speakers designed and manufactured abroad; and finally, to take up the challenge of designing and/or manufacturing such speakers on domestic soil. The first approach proved to be a source of more humor than success as a variety of inmates on the various audio forums reported the great success they enjoyed mating their beloved B&W 801 speakers with the latest 8-watt 300B SET to land on shore. And the occasional reviewer could always be counted on to extol the virtues of matching a single-ended amp with the likes of a Thiel or Magneplanar speaker. It's too bad these reviewers appear not to have had the pleasure of mating their single-ended amplifiers with the mbl line-up. There is, after all, a difference between a speaker being able to play at loud volumes with an amplifier and the amplifier driving the speaker. And the sound of second-order harmonic distortion can be confused with the warm, phasey, fuzzy sound of tubes by those who have only read reports of what single-ended tubes sound like. The nice thing about some reviewers, inmates and audiophiles is that they can sometimes play interchanging roles in the oft-repeated narrative of the blind leading the naked. The second approach accounts for the flood of Beauhorn, Avantgarde and more recently, Hørning speakers to our mainland. The vast majority of these are hybrid designs mating horns with dynamic woofers in an effort to extend the bottom end of the speaker. That is the approach favored by Avantgarde, Hørning and Oris whereas Beauhorn and Hedlund, for example, have opted for the full-range single driver approach, choosing to maximize purity and immediacy at the cost of sacrificing extension at the frequency extremes. The past half dozen years or so has seen a tremendous growth in home-grown horn-based speakers. At the forefront have been Lowther America, The Horne Shoppe and Cain and Cain (and Rethm in India), all of which have favored the implementation of a full-range driver in a back-loaded horn cabinet. The main difference has been the driver each has employed, with Lowther America and Rethm relying unsurprisingly on Lowther drivers while Cain and Cain uses Fostex drivers. One might wonder why designers here in the States have not returned in large numbers to their roots and taken up the task of revisiting, revising and perhaps improving the designs of Altec and especially JBL. There are many reasons for this. The patents for the original designs are likely still held by JBL and Altec and reproductions might require incurring licensing fees. The original drivers, especially the glorious 375 compression driver that graces the early Hartsfields, are no longer in production and extremely expensive to purchase if you can find any. Altec went out of business for a time and has recently returned. Though sometimes said to be superior to the originals, I have not found this to be the case. Most importantly, perhaps, all of these designs, without exception, would be aesthetically challenging in most home environments. use of very cheap and not particularly good drivers. This is not true of the earliest designs and not true at all of the Vitavox which was built using better parts but employing almost the same design approach. 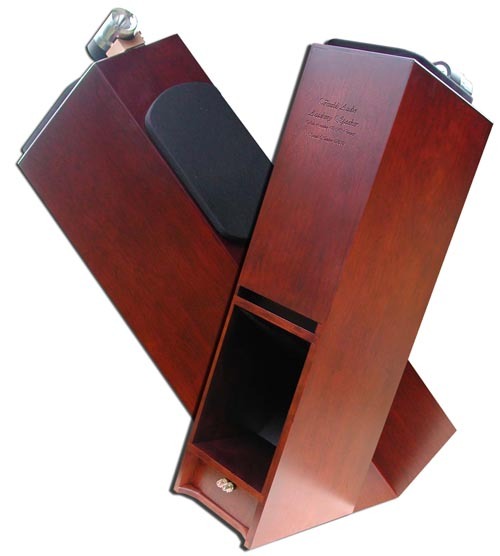 The Klipsch La Scala, which does not require corner loading and placement, is a bit more room friendly and also occasionally finds its way into two-way horn designs when used exclusively to reproduce bass. Still, the rebirth of horn designs in the United States has favored slimmer, room-friendly and aesthetically less challenging designs (with the exception of the Rethm) and favor the use of back-loaded horns. A back-loaded horn employs the back wave produced by a dynamic driver and amplifies it through the use of folded horn (sometimes simple as in a Voigt pipe like the Cain & Cain Abby and other times complex in design as in the Second Rethm) in an effort to extend the bottom end of a full-range driver and to add a sense of weight and authority to the sound. Without such an approach, a full-range driver will often sound thin and a bit tipped up. Even in a back-loaded horn, most of the sound is being directly radiated forward from the driver. Very little of the frequency range is being reproduced via the horn. There are a surprisingly large number of manufacturers of full-range drivers that can be implemented in these speaker designs: the most well known of these are Lowther and Fostex. Others include AER, Reps and PHY. I have had experience with all of these, though my experience with the Reps was very limited. I owned original Fostex 208Sigma drivers (which have since been replaced with lesser versions of the same driver) in a Jericho horn; Lowther PM2A drivers in both Medallion II and Oris 200 horns (the latter being front-loaded); the Lowther DX4 in the Hørning Agathons and Alkibiades (where it was implemented as a midrange driver); AERs in the same Oris horn; and I currently own PHY drivers in the open-baffle SoloVox speaker. Of these full range drivers, by far the most ubiquitous is the Lowther. Lowther has been designing and manufacturing full range drivers for over fifty years. Various Lowther drivers are used by such diverse manufacturers as Beauhorn, Carfrae, Horning, Hedlund, Rethm, Oris and Lowther itself, to name just a few. Often employed as a full range driver, and occasionally supplemented by a dynamic woofer (e.g. Carfrae and Oris), the Lowther driver is sometimes used as a midrange driver alone (as by Hørning). There are more different Lowther drivers than you might imagine. There are 8" and 6" drivers, those with Alnico magnets and those employing more exotic and much lighter magnets. When left to their own devices, all Lowther drivers I have heard exhibit the famous Lowther peak somewhere in the presence region. Left unattended, this peak can come across at first as giving the impression of much more information and greater detail and treble resolution. The sound is hypnotic and unlike anything you have ever heard before. The immediacy and vividness is unparalleled. Unfortunately, it is only a matter of time before the peak gets to you. It will drive anyone with normal hearing and any experience with real music nuts. One of four things will likely happen. You will stop listening; listen from another room only; listen only to music that doesn't threaten your sanity; or sell them to someone else who will be awestruck before repeating the pattern. With so much going against it, why has the Lowther driver survived for so long and why do so many designers work so hard to tame the peak and build speaker after speaker around it? Lowther must be on to something, given how many efforts to create full-range drivers have followed in its footsteps! The answer is that a Lowther driver can be intoxicating. Music reproduced through a Lowther driver is immediate, vivid, resolute and dynamic in a way that is unlike nearly any other driver. Implemented full range, which means, absent a crossover, the driver produces music that is, in addition to being immediate, vivid and resolute, entirely coherent and alive. In fact, the only thing that can kill it is a poor cabinet design. Having heard a lot of drivers that are implemented in similar ways to the way in which Lowther has, my experience is that the original Fostex 208 is smoother, easier on the ears but much less resolving and informative. The AER is better balanced, less immediate and more expensive. The Reps bests the Lowther in nearly every way but is extremely expensive, hard to locate and even harder to have serviced. The PHY I have heard is proprietary and perhaps not representative of the entire line. I have heard it only in open-baffle, not in horn-loaded designs and so resist offering any comparisons for now. The motto of many a designer who has heard a Lowther driver must be something like, "I'm going to build a speaker around this driver that maximizes its strengths and minimizes its shortcomings, even if it kills me (or more often, drives me out of business)." I don't know that such efforts have led to death by natural or unnatural causes but it has led to an incredible number of efforts and various forms of implementation  some more successful than others. Lowther the company has focused on driver, not speaker design. In that way, Lowther is very much like the early Tannoy Company. Originally Tannoy was a driver company. It manufactured terrific concentric drivers with horn-loaded compression tweeters in 10", 12" and 15" woofers. Tannoy offered just a couple of cabinet designs for their speakers, the most famous of which is the original corner horn GRF, which would probably go for around 25K (for the cabinet alone) on the open market if you could find one. Lowther took a similar approach offering up a few cabinet designs to house their drivers, while offering plans and suggestions to customers and inviting others to build speakers around their drivers. Perhaps the best and certainly the most demanding of these plans for implementation is the Academy design which was implemented by Lowther in the Bicor speaker. The Academy design features two Lowther drivers (making it immediately more expensive than any other Lowther speaker). One driver fired forward and the other was upfiring at a rear angle. The most difficult part of the construction was the incredibly complicated folded horn labyrinth into which both drivers were loaded.